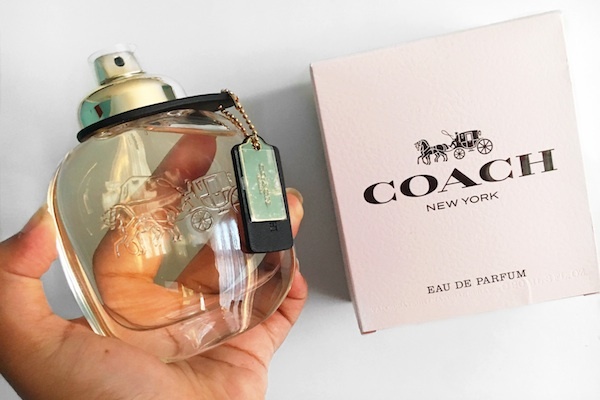 "Coach Eau De Parfum is the ultimate accessory, embodying the values and heritage of the iconic American luxury brand. Created by perfumers Anne Flipo and Juliette Karagueuzoglou, it is a floriental fruity scent inspired by the spontaneous energy and chic downtown style of New York City. A fragrance full of contrasts, Coach EDP opens with bright, sparkling raspberry which gives way to creamy Turkish roses, before drying down to a sensual suede musk base note". I've always seen Coach items on the runaway as well as on high end magazines such as Harpar's Bazaar so receiving this is the post was super exciting. The packaging is gorgeous, as is most high end fragrances. It comes in an oval shaped bottle that has a the brands heritage - the Coach spirit, embedded in the front along with the leather hangtag across the neck. The fragrance is super strong and lasted about 6-7 hours on me. It's part of the floral/fruity family. It consists of a very sharp fruity scent, raspberry and pear and settles down to the smell of Turkish roses and sandalwood. It's such a perfect scent for daywear, as well as night.